‘Mother of the Hidden and Mystical Wounds’. Second Vatican Council, Lumen Gentium, Dogmatic Constitution on the Church, The Role of the Blessed Mother in the Economy of Salvation, no. 58. ‘…..[T]he Blessed Virgin advanced in her pilgrimage of faith, and faithfully persevered in her union with her Son unto the cross, where she stood, in keeping with the divine plan, grieving exceedingly with her only begotten Son, uniting herself with a maternal heart with His sacrifice, and lovingly consenting to the immolation of this Victim which she herself had brought forth. Finally, she was given by the same Christ Jesus dying on the wood of the cross as a mother to His disciple, with these words: “Woman, behold thy son” (Jn 19:26-27). Divine Office of the Church, from the Common of the Saturday Memorial of the Blessed Virgin Mary. Reading from the homilies of St. John Chrysostom. ‘….A virgin, a tree and a death were the symbols of our defeat. The virgin was Eve: she had not yet known man; the tree was the tree of the knowledge of good and evil; the death was Adam’s penalty. But behold again a Virgin and a tree and a death, those symbols of defeat, become the symbols of his victory. For in place of Eve there is Mary; in place of the tree of the knowledge of good and evil, the tree of the Cross; in place of the death of Adam, the death of Christ.’…. Divine Office of the Church, from the Common of the Blessed Virgin Mary. Reading from the sermons of Aelred of Rievaulx. ‘Let us come to his bride, let us come to his mother, let us come to the best of his handmaidens. All of these descriptions fit Blessed Mary. 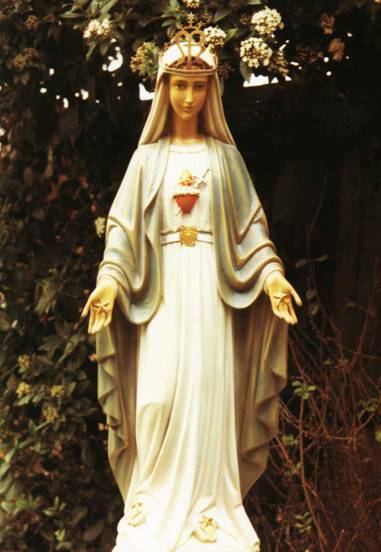 In this inspiration Our Lord wishes His Mother to be known under the title of “Mother of the Hidden and Mystical Wounds.” Our Lady said that she had come to tend the hidden wounds of her children and to encourage them to regain and live in innocence according to the Gospel, the Sacraments and the teachings of the Holy Catholic Church. Our Lord and Our Lady spoke of innocence being crucified all over the world, because God’s Law is broken and the sins of the people cause many spiritual and social ills. Our Lord wants the Hidden and Mystical wounds of Our Blessed Lady to be honoured. Our Lady always draws us to the saving Wounds of Jesus and His perfect Sacrifice on the Cross, where He won our salvation. Our Lady. I am the Immaculate Mother of God, Mother of the Hidden and Mystical Wounds – Mother of England and Mother of the world. I come to gather in all my children everywhere. It is only in a mother’s arms that a child is safe. My arms are open to receive you so tenderly. No one who comes to me will be lost! October 1985. St. Agatha's Church, Kingston. Stations of the Cross. Our Lady. My child, I open wide my Mother’s arms to you and all my poor wounded children. Here, you will receive healing, comfort, and so many graces. I, your Mother, know of all your hidden wounds and suffering. You can tell me everything. Come and nestle on my Heart. See, it beats for you, not just as part of the human race, but beats personally for you in particular. Do you think that my Son would turn you away, my own dear child, if I have carried you, all wounded, to His feet? See my son’s feet – they are wounded for children like you. Our Lady. I gladly bear these Wounds for love of my Eucharistic King in the Most Holy Sacrament of His Body and Blood! Jesus. Invoke the intercession of the Mother of the Hidden and Mystical Wounds! From these wounds pours a healing balm; the balm of Humility, the healing oil of Purity, the ointment of Faith, Hope and Charity. Turn to your Heavenly Mother. Her Eucharistic Heart is impelled to draw you to My Eucharistic Heart. Bring your sick to My daily Benediction. Daily I wish to flood souls in My healing love! I request you, do not abandon this chosen spot (Surbiton, Surrey, England where the foundation house now stands). I desire to show you My Almighty Power and the power of My Eucharistic Blessing. Today you make history! Request the Church to allow this Feast to be celebrated each year on this day, August 17th.- the Feast of the Mother of the Hidden and Mystical Wounds. Patricia. At the singing of the hymn “O Fairest of Creatures'' Our Lady's statue of the Mystical Wounds was shown surrounded by a great light. The stars on the hands, feet and the heart of Our Lady are shining like real stars. Our Lady is happy and sad at the same time – sad that, after all this time and her many visits here, few know or understand her role as Mother of the Hidden and Mystical Wounds. She is also happy and love fills the light around Her. From the Eucharistic Heart of Our Blessed Mother pours a deep and Motherly love for us. Today Our Lady looks little and frail but there is a great power in Her Motherly love for us and for all mankind. Our Lady. You do me a great service today in honouring the Mystical Wounds acquired through a deep and intimate sharing in my Son's Passion. Let Processions come! Patricia. Dear Lord, how I have longed to share this grace with others, yet so many have walked away, some afraid, some with indifference. Others do not understand. I feel like a mother who has lost children and just cannot reach them. It is a constant interior pain and longing, for unity, peace and loving reconciliation. Jesus. My child, you are drawn into your Heavenly Mother’s Mystical Wounds and her wounded heart. If the Blessed Mother of the Hidden and Mystical Wounds only looks towards Me with Motherly love, on behalf of a soul who rejects Me, how can I refuse her tender motherly anguish and silent pleading? Mothers who plead and weep for their children render Me all but helpless, and mercy flows in abundance like a great river. Freewill builds dams that impede graces. The tears and prayers of your Heavenly Mother, and all mothers, release graces that break through those dams. Sadly, souls so quickly rebuild these dams! Our Lady. Jesus is the Doctor, I am the nurse!